When I’m giving a tour through Henry House and we get to the bedroom, I typically find myself asking if my guests have heard of Oshawa’s Gibbs brothers? The answer I usually receive is “No,” however, if I ask them if they’ve heard of the McLaughlins, “yes”es and head nods are the response. The story of Oshawa’s own BeeGees (Brothers Gibbs – see what I did there?) has seemingly been forgotten over the years. Who were they, why are they important, and why was Gibb Street named for them? The brothers were born in Terrebonne, Quebec where they lived until 1832 when they moved to Oshawa. Their father, Thomas Gibbs, helped run the South Oshawa Milling Company owned by their uncle, John Gibbs. When they were older, both boys were sent to England to be properly educated. They returned to Oshawa where they helped their father and uncle with the milling business. As time passed, the brothers became known among the leading millers of Ontario and within three years they had acquired most of the cultivated land from Lake Simcoe to Lake Ontario. When the first village council was elected in 1850, Thomas Gibbs was named Oshawa’s first Reeve. He tried moving into Canadian politics in 1855 when he ran for the North Ontario riding but was easily defeated. However, Thomas ran for the South Ontario riding in 1867 and won by a surprisingly large majority. 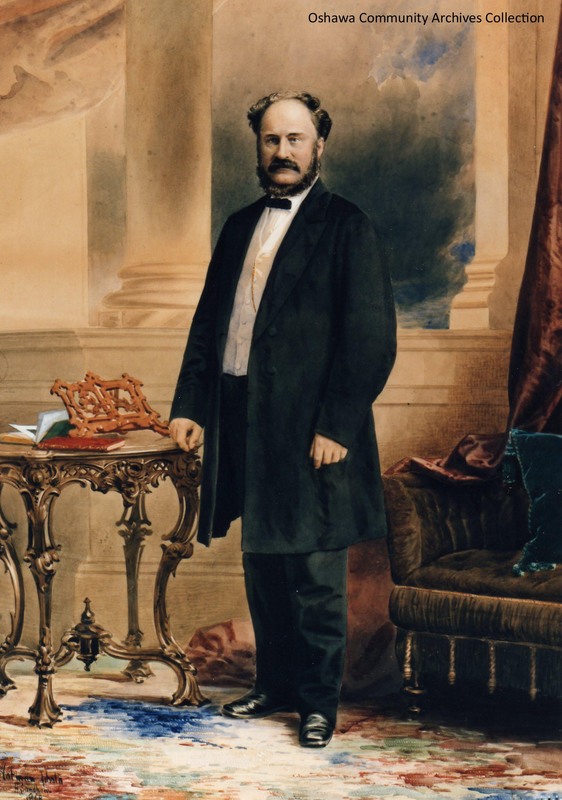 There were strong suspicions that the vote had been fixed or that the voters had been bribed but it could not be proven, and Thomas sat as a Member of Parliament until 1874, even serving in Sir John A. Macdonald’s cabinet. William’s political career was much like that of his older brother. In 1855 he was elected Reeve of Oshawa and, Deputy Reeve of Whitby. In the same year he held the position of Warden for North Ontario County until 1879 when he was elected as Oshawa first Mayor. In 1865 when the Warren family when bankrupt, the Gibbs brothers acquired all of the Warren assets. Now the brothers owned the Warren Mill, two distilleries, an estate called Prospect Park, the Western Bank, and other Warren property and workshops along King Street West. Under their management, the Western Bank quickly became a strong financial institution, and together they established the Ontario Loan and Savings Company which helped get many Oshawa industries off the ground. Thomas played a major role in opening the Simcoe Street United Church in 1867. After this long period of prosperity and happiness, the Gibbs milling business suffered a fatal blow. The price of the Gibbs main crop, barley, was falling and they had at least two thousand bushels on their hands. It was decided to send the barley to New York where the demand was still good but, the winter came early and froze their ships in the Erie Canal. The barley was ruined so it was shipped to England as cattle feed and the Gibbs did not receive a cent in return. Today, Gibb Street is an east-west Regional Road, maintained by the Region of Durham. It is not clear why the ‘s’ was dropped, but Gibb Street has been named for these brothers. I frequently refer to the County of Ontario Atlas when writing these posts, as it provides a glimpse of our city from almost 150 years ago. 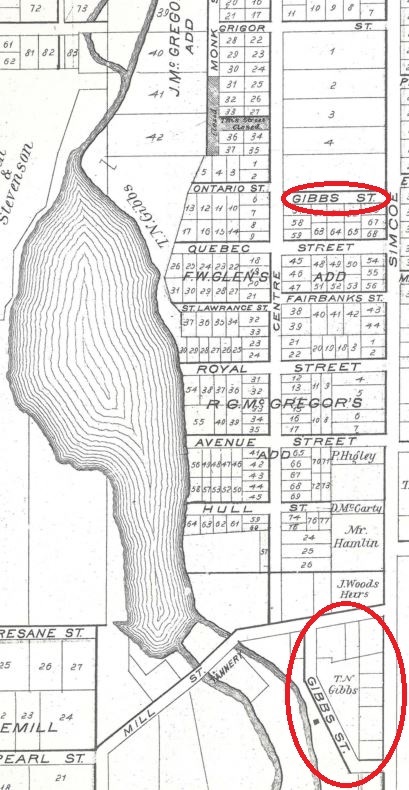 Below is a snapshot from this 1877 map, with Gibbs Street circled. You will see many streets that are still around today, and note Gibbs Street appears twice: the northern Gibbs Street is close to its current alignment. The southern Gibbs Street today is St. Lawrence Street (which appears in the map where Fairbanks Street is today). The southern Gibbs Street is also surrounded by land owned by TN Gibbs. It is unknown exactly when the street names changed, or when the ‘s’ was dropped from Gibbs Street. A Fire Insurance Map from 1911 shows St. Lawrence and Gibbs (with the ‘s’) at its currently alignment, but by 1921, the City Directory shows Gibb without the ‘s’. Much like how Phillip Murray Avenue adopted a second ‘l’ in its name, the reasons why Gibbs dropped the ‘s’ is unknown. Perhaps it was a clerical error which has persisted. Now, why do I talk about the Gibbs when I’m in the Henry House Bedroom? 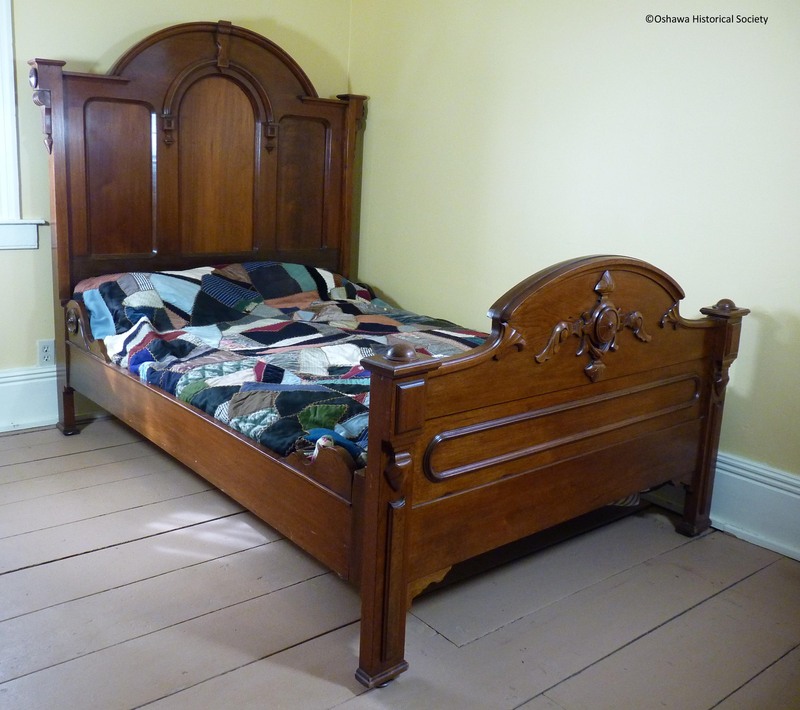 The bed in the room was made by a furniture company owned by the Gibbs, and when talking about this artifact, a conversation about the brothers comes about. I have also discussed Thomas Gibbs previously on this blog; a treasured artifact in our archival holdings is a letter that was sent to Gibbs by Prime Minister Sir John A. Macdonald. For a history junkie, it doesn’t get any cooler than that. ¹Information about the Gibbs Brothers adapted from a Historical Oshawa Information Sheet, ©Oshawa Historical Society. This entry was posted in Street Name Stories and tagged Archives, Gibbs, Gibbs Brothers, Heritage, Historical, History, Local History, Oshawa, Oshawa Community Archives, Oshawa Community Museum, Street History, Street Names, Streets, TN Gibbs, WH Gibbs by oshawahistoricalsociety. Bookmark the permalink.